Founded in 1828, Guerlain is one of the world’s oldest and most celebrated heritage perfume houses. Originally, it was based at 42 Rue de Rivoli is Paris under Pierre-François Pascal Guerlain. Following its enormous success among the bourgeoisie, it then opened a flagship store at Rue de la Paix in 1840. However, these have since closed and their flagship store today can be found at No 68 Avenue des Champs-Élysées – the most beautiful avenue in the world. Opening its doors in 1914, it hosted the world’s first beauty salon with walls featuring 17 different styles of Carrara marble. A specimen of Art Nouveau architecture, it was built by Charles Mewès who was the man behind both the Paris Ritz and London Carlton. Today, it is recognised as a national historical monument and protected under French preservation laws. In 2013, the store closed for renovation under the celebrated architect Peter Marino to celebrate its 100-year anniversary. On the 23rd November of the same year, they reopened their doors to much fanfare. The store’s layout today features a more contemporary interior that still preserves its historical significance. A number of extensions were made including a 2000 square-foot (185 m²) pop-up shop being fully-incorporated into the storefront. Overall, the store doubled in size following the renovations and now sprawls over 1600 m² (17222 square feet) on four storeys. This makes it the largest monobrand perfume and cosmetics store in the world. Other additions to the store include a basement restaurant and tea salon, the Le 68 Guy Martin. This is a joint venture between three-time Michelin-star chef Guy Marto, and Thierry Wasser, Guerlain’s in-house perfumer. Accessible only by private elevator is also the exclusive Institut Guerlain, a beauty spa that offers made-to-measure treatments for its prestigious clients. Where Is Guerlain’s Flagship Store? As it’s based on the Champs-Élysées, Guerlain’s store is quite easy to find. However, despite its Art-Nouveau design, it’s more understated than its neighbours with smaller signs and windows. Therefore, make sure to keep your eyes open when walking down the avenue! Nevertheless, you can easily spot it as its right in between Tiffany & Co and a Fnac department store. The full address is 68 Avenue des Champs-Élysées, 75008 Paris, France and it can be accessed by metro, taxi or by foot depending on your location. Although the Paris metro can be somewhat confusing for newcomers, the Champs-Élysées is one of the easiest places to reach. Guerlain can be found right between stops Franklin D. Roosevelt and George V, which are both on the Line 1 (yellow line). Additionally, Franklin D. Roosevelt hosts Line 9 (mustard line) if you’re coming from the Left Bank. Given that single tickets cost only 1.90€, it’s the cheapest way to travel around Paris. You can also purchase a packet or “carnet” of 10 tickets for only 14.50€. You can use the official RATP app to help you navigate Paris. However, I find that Citymapper is a much more streamlined and well-made app for getting around. Of course, if you prefer private transportation to get to such a privileged location, taxis are always a viable option. Nevertheless, know that Uber is very active in Paris so you can conveniently use its app while you’re there instead. On a busy Saturday afternoon, my wife and I stepped in from the avenue’s hustle and bustle into Guerlain’s quiet sanctuary. Before being greeted by one of the many sales assistants, the first thing we noticed was the airy atrium adorned in marble. Whilst the rest of the boutique was fresh and contemporary, the atrium itself seemed true to the original architecture. On the far end, a winding spiral staircase with a brass and iron banister led up to the second floor. Crystal chandeliers poised over each corner of the room and under them were marble counters featuring various collections. After a few moments of taking our bearings, we were led into the next room, which was effectively a spacious corridor dedicated to the various collections. Each of the shelves featured exquisite displays, which were more of an art-form than marketing. Rows of flacons were grouped and regrouped in different sections in order to present each fragrance slightly differently. The left-hand side was dedicated to the classic releases such as Shalimar and l’Heure Bleue. Meanwhile, the right-hand side showcased the store’s exclusive offerings. Taking full advantage of the spacious area, the flacons were carefully spread apart and each section was separated so not to overwhelm the client. This also avoided scents crossing and causing olfactive senses to be overwhelmed. A plethora of tester strips were available but many flacons were positioned behind little porcelain bells for testing the fragrances too. Each display was unique and offered a visually engaging approach to the range it showcased. If anything, it felt more like perusing an art exhibition rather than shopping for perfume! At the end of the corridor, the tills were discretely tucked away opposite an enormous flatscreen television that broadcasted various images. In order to get there, you’d cross a little beauty corner where assistants could do your make-up or help you test various cosmetics. Out of curiosity, we headed up the aforementioned spiral staircase to see what more Guerlain could possibly offer. Interestingly, we got up there to find the same fragrances but displayed in an entirely different way. Although Guerlain was far from crowded, the upstairs floor space was almost empty and felt quite intimate. Whilst downstairs embraced the regal aesthetic of white marble, upstairs was a mariage of different arrangements of veneered wood. At the centre was a large wheel on which flacons were placed for another perspective on the fragrances. Behind it was a large window, which overlooked the Champs-Élysées. Meanwhile, each corner featured a different space for trying out the various perfumes. There was even a small table where you could sit and compare several fragrances. During our tour, we’d often see the same fragrances several times. After all, there well over 30 perfume ranges with their respective flankers spread over a 1600 m² floor space. However, this never became monotonous and each approach to displaying the fragrances revealed a new facet. 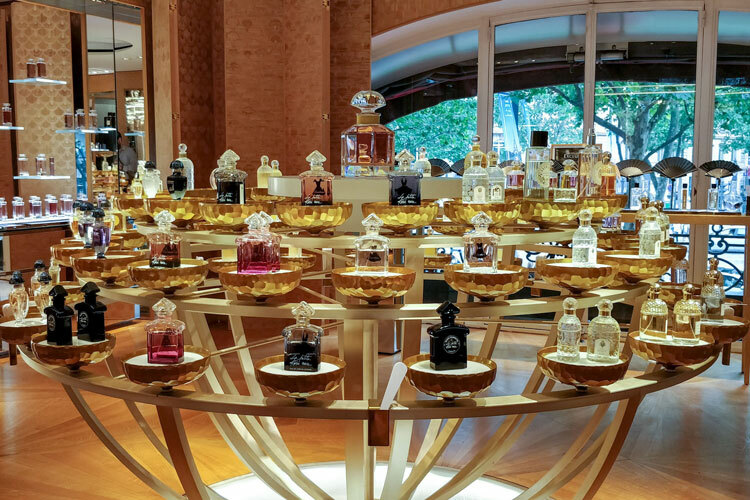 As you’d expect, Guerlain’s flagship store hosts their full range of fragrances. You’ll see the staple options such as Shalimar, la Petite Robe Noire and l’Heure Bleue for women as well as L’Homme Idéal, Vetiver and Habit Rouge for men. However, you can also explore Guerlain’s exclusive fragrances. Some of their exclusivities are only available at Guerlain stores as well as Harrod’s and Selfridges. From the heady “Absolus d’Orient” unisex collection to the both the Parisiens and Parisiennes, it’s easy to lose yourself. The Parisiens are mostly reinterpretations of Guerlain classics and the most exclusive masculine range. However, there are some newcomers such as the two Lupin fragrances and Le Frenchy. I was particularly fond of Le Frenchy as it featured an overt petitgrain and verbena head for a wonderfully summertime fragrance. Meanwhile, Chamade was first released in 1999 as a limited edition but returned through popular request. This woody spicy fragrance is also a breathtaking summer fragrance with bergamot in the head, hyacinth in the heart and a leathery vetiver woody base. Each of the flacons are made in a consistent style with a wooden frame and cap in that wrap around the glass. They all use the same font for the printed name down the side but the wood is treated in a slightly different colour in order to distinguish them. A range that truly embedded itself in my mind was the Absolus d’Orient, a selection of three Middle Eastern-inspired fragrances. Immersive and intoxicating, these three premium unisex fragrances are presented in unique black bottles shaped like the Guerlain bee flacons. My wife was particularly fond of the Santal Royal, which was slightly more feminine thanks to a peach and rose accord. However, I was blown away by the Oud Essentiel, which is a linear blend of Agarwood, cedarwood, rose and saffron. Although not an exclusive range, I felt it important to at least mention Guerlain’s Les Eaux range. Les Eaux features an eau de cologne for each of Guerlain’s perfumers. Therefore, it’s their most historical selection and reflects their evolving yet consistent identity over the last 165 years. The oldest fragrance from this collection is Pierre-François-Pascal Guerlain’s famous Eau de Cologne Impériale. Released in 1853, it was their first to feature their iconic bee flacon. Especially made for Empress Eugénie, Napoléon III’s wife, it earned him the title of Perfumer to His Majesty. The latest addition to the collection is Cologne du Parfumeur, which was Thierry Wasser’s contribution released in 2010. Being the first house perfumer not to have Guerlain as a surname, this blend symbolises his incorporation into the prestigious family. 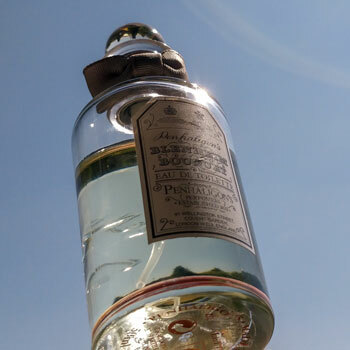 Being eau de cologne, their concentration is much less than a regular perfume. Therefore, they’re not to be worn as all-day fragrances but fleeting moments of scent to refresh yourself during a hot day. I often use eau de cologne as part of my grooming regimen so I decided to take one home with me. Although the choice was difficult, I actually chose Jacques Guerlain’s 1920 Eau de Fleurs de Cédrat. I’ve already reviewed it if you want to learn more about this refreshing cologne! Being a prestigious store, it’s no surprise that the customer service was second to none. However, it was also refreshingly down to earth. Whilst you could tell that the assistants were experts in their domain, they never once seemed impatient or condescending. If you ever go fragrance shopping, you’re probably aware that this is a risk so it was delightful to see that it the case here. We never felt rushed or hovered and were able to truly enjoy our time. Conversely, we didn’t feel abandoned in the expansive store either! Although Guerlain sells its products at full retail and online outlets offer discounts for their regular fragrances, there’s certainly added value for money in the advice and service you get here. Therefore, it’s certainly worth paying extra for the guidance and care during your visit. I genuinely enjoyed my few hours in Guerlain’s olfactory temple. Sheltered from the chaotic street outside, I was able to explore some of French perfumery’s most refined creations. However, despite being an exclusive and prestigious experience, it’s accessible for all. Stopping by and testing the fragrances Guerlain has to offer is a pleasure that’s free of judgement and scrutiny. It’s remarkably welcoming space that I look forward to exploring again soon. Reviewed by Charles-Philippe on June 4th, 2018 . "A wonderfully liberating experience! I was enchanted by my visit to Guerlain's flagshop store and hope to return soon." Great review and pictures CP! Can’t wait to go next time I am in Paris. Glad you enjoyed the article. It’s a definite must-see and Louis Vuitton is just up the street too if you’re interested. Saviez-vous s’il y a un service de maquillage ? Je souhaite offrir un cadeau à ma mère avec une séance de relooking. Je pense que oui. Si je me rappelle bien, il y a également des ateliers de maquillage qui pourraient vous intéresser. Afin de réserver une séance, je vous conseille d’appeler la boutique directement sur le +33 (0)1 45 62 52 57.